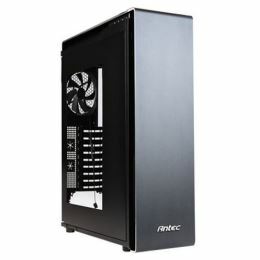 The P380 is a successful blend of the stylish design, sophisticated cooling and proven Quiet Computing ™ features of Antec’s award-winning Performance One enclosure series. Like all models in the series, the P380 is equipped with double-layered noise-dampening side panels, creating a system that is almost inaudible even when the fans are spinning at a high speed. The P380 is compatible with CEB and standard ATX motherboards. The elegant aluminum front panel features two well-placed USB 3.0 and USB 2.0 ports, and audio in/out jacks. The case boasts one slim optical drive bay, three antivibration 3.5"/2.5” removable drive cages (eight 3.5"/2.5” HDD bays).